As we started to prep for Interbike and plan our discussions, we sat down with a few friends who work for a US distributor of bikes a few weeks ago. We were talking bike rentals with them, seeking their advice given their acute insight to the bicycle industry. We asked about demo bikes. As background, demo bikes are a usual part of a manufacturer’s or distributors sales program designed to allow consumers to “try” before buying. These demo bikes are usually used as part of an overall Demo program that the brand managers develop as part of their sales and marketing plans. Trek Factory Demo is a great example. The problem with these and many other programs like this is they are limited many times to only a day or two in a particular city, like Interbike’s Outdoor Demo Sept 12-13 in Las Vegas. This event in particular points out a couple of issues. First, Interbike isn’t designed for consumers, it’s for dealers (bike shops). Second, with consumers, who already have a limited window of time because of family and friend commitments, can many times miss the day the demo bikes are in town, meaning there are limited opportunities to “try” the bikes. Last, we also learned that many smaller manufacturers just simply don’t have the budget to roll-out a nationwide series of Demo Days. They have the demo bikes but using a traveling caravan to host Demo Events can be cost prohibitive so they limit their demos to the IBD “buying” events, without any real plans to get consumers on those bikes. Case in point, we come to find out that this distributor has almost a stockpile of demo bikes provided to them from a European bike manufacturer that they use throughout the year as demos. Because the number of demo events are limited and a real pain to deal with in terms of shipping logistics and cost, 90% of the time the bikes sit in a warehouse collecting dust. Just the opposite of the sales goals of a demo program, right? So we asked, why not rent them out when they are not being used? They seem so under utilized and not effectively getting to the consumers to sample. The answer, we are not set up to deal with that and the bikes are only in a single location. Hold on a second, we said. The goal is to get more and more people to put their butts on bikes so they can try them out because if you can really try the bike out, you might be more inclined to buy one. Right? Consign those bikes out to your top 20 shops/locations and list them for rent on Velolet. Get them out to places throughout the country like California, Oregon , New York, Colorado, Texas, Florida, etc.. Use the IBDs as your sales and marketers. It also doesn’t matter whether you are a big or a small manufacturer, by putting even 1 or 2 bikes at your dealers, you provide a much larger exposure then your current program which will inevitably lead to higher sales. Velolet can handle the entire process, working with the IBDs directly. Don’t forget we cover the liability insurance so everyone is protected. We also collect a tremendous amount of data that the distributors and manufacturers can use to see rental trends and conversions and customize their demo sales program as needed. What does this all Velolet program accomplish? It gets more people trying your bikes which inevitably leads to increased sales. That’s the goal right? It also provides the IBD the ability to earn income to buy the consigned bikes for end of season sales, all while earning rental income. 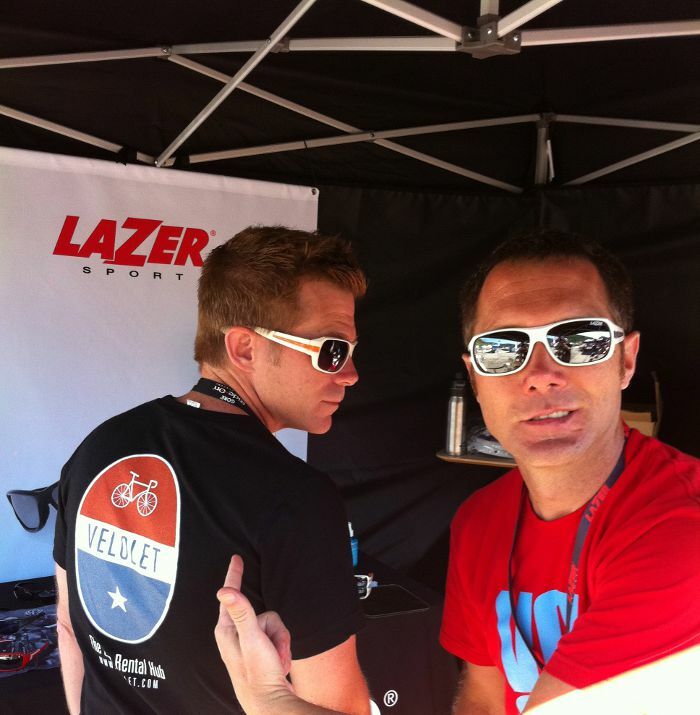 We will be stopping by your booths at Interbike and we would love work out a gameplan with you. Trust us, it is worth your time. After all, we are the best online bike rental resource for your customers to find bike rentals. This entry was posted in Bike Rentals, Our Reasons and tagged bike rental, las vegas bike rentals. Bookmark the permalink.